Home » Claims News, News » Paper Cheques: Here Today, Gone Tomorrow? Paper Cheques: Here Today, Gone Tomorrow? Boston, MA (Jan. 28, 2019) – Insurers are becoming more digitally-based, data-driven organizations that are investing in the customer experience to address the new expectations of today’s consumer. But at the same time, there are always some old habits that die hard – habits that need to change but somehow remain the same. Today’s consumer is doing more and more online or on a smartphone every day. We pay for coffee with an app; we pay with our eWallet at the grocery store; we transfer money between our bank accounts on our smart-phones. With services like Venmo and PayPal, we are able to pay friends and family electronically. Consumers have come to expect this ease and convenience in every area of their lives. When it comes to insurance, we are seeing things change. Insurers have taken steps to create an easy and efficient process for their customers from quote to premium payment to claims intake. So, the payment process has certainly transformed in insurance … but only to a point. The next step in the transformation needs to come at the moment that really matters for an insured – the claim payment. Paper cheques are still substantially used by the industry to provide outbound payments in the claims process. Cheques are one of the most expensive forms of payment and create a delay in accessing the funds. All parties involved with the payment process – claimants, third parties, mortgagees, and lienholders – are looking for a change in the traditional cheque process. It is easy to imagine how a positive experience could quickly be forgotten if a customer has to wait for a paper cheque. Insurers must take the next steps to meet growing customer expectations. The good news is that as fast as customer expectations are changing, new payment technologies are becoming available. While there will be challenges to address to make it happen, insurers may soon be able to put the paper cheque to rest. 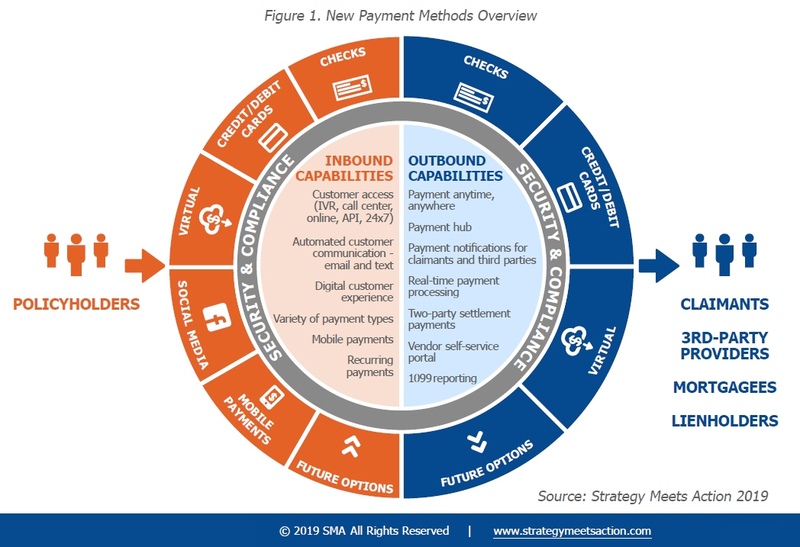 Strategy Meets Action’s newest report, The Payment World Explodes: The Need for Digital Customer Experiences Is Driving Payment Innovation, offers insights into the state of payments in the industry today and the direction that payments are headed in the future. To learn more, see below. Transformation is picking up speed throughout the inbound and outbound payment world in insurance. 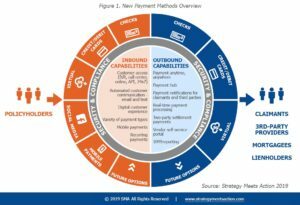 This Strategy Meets Action research report provides an overview of the exploding landscape of payment processing, with a deep dive into both inbound and outbound payment methods. It highlights key capabilities for payment expansion in each direction, reveals challenges and proposed solutions, and identifies vendors operating in both the inbound and outbound payments spaces. This report will give insurers the context needed to develop future-focused payments strategies. Click here for the table of contents or to purchase the report. For more industry research and reports by Strategy Meets Action, please visit strategymeetsaction.com/our-research. Karen Furtado, a Partner at Strategy Meets Action, is a well-known authority on insurance technology and how it fuels transformation within insurance companies. Her focus is helping insurers prepare for the future of the industry through the decisions they make today. Karen’s deep understanding of how to effect change guides insurers in the development and implementation of their transformation roadmaps. Her comprehensive knowledge stretches across core systems, the implications of InsurTech, and enhancing adaptability and flexibility in a changing market. Her commitment to promoting innovation, encouraging the exploration and adoption of new technologies, and developing proactive ways to plan for the future draws those seeking an edge. In a highly competitive world, Karen brings exceptional knowledge and experience to the challenges of connecting solutions to business and IT requirements. During her career in the insurance industry, Karen has leveraged her business and technical experience to enable insurers to meet a wide variety of challenges. Many insurers have benefited from her advice that spans a broad field of expertise including enterprise application strategies and implementations, the influence of a rapidly changing business and technology landscape, and outsourcing services. Karen’s opinions on insurance, technology, and transformation are highly regarded and often sought after by the press. She contributes to a number of insurance trade journals and is also a frequent keynote speaker at major industry conferences.